Emerson assumes that there is a perfect parallel between the world of things and the world of values. He could come to terms with himself and with Nature because he saw them as outward manifestation of spiritual realities. The essay, “Experience”, written after the death of his baby-son, bears a note of scepticism; for him, life becomes a struggle to maintain a code that is both ideal and liveable. In his last important work The Conduct of Life (1860), he translates the poetic confidence of youth into the sage acceptance of both Unity and Necessity. By realizing his spiritual power, man is once firmly at the centre of his universe, not to be dislodged by the doubts of later years (Spiller qtd JLS, 2). Following this pioneering work, Emerson delivered a speech titled “The American Scholar” in 1837, which Oliver Wendell Holmes Sr. considered America’s “intellectual Declaration of Independence”. Emerson lent an intellectual basis to the nineteenth century man’s disillusionment with the craze for urban lifestyle. Emerson wrote most of his essays as lectures first and then revised them for publication. His first two collections of essays, Essays: First Series (1841) and Essays: Second Series (1844), convey the core of his thinking. They include the well-known essays “Self-Reliance”, “The Over-Soul” “, ” Circles”, “The Poet” and “Experience”. Together with “Nature”, these essays made the decade from the mid-1830s to the mid-1840s Emerson’s most productive period. Emerson wrote on a number of subjects, never espousing fixed philosophical tenets, but developing certain ideas such as individuality, freedom, the ability for mankind to realize almost anything, and the relationship between the soul and the world surrounding it. Emerson’s “nature” was more philosophical than naturalistic: Philosophically considered, the universe is composed of Nature and the Soul. Emerson is one of several figures who took a more pantheist approach by rejecting views of God as separate from the world. Emerson remains among the linchpins of the American Romantic Movement, and his work has greatly influenced the thinkers, writers and poets that followed him. When asked to sum up his work, he said his central doctrine was ‘the infinitude of the private man.’ Emerson is also well known as a mentor and friend of Henry David Thoreau, a fellow transcendentalist. Later in the nineteenth century, in a remote corner of western Odisha, the saint-poet Bhima Bhoi preached the message of love and instilled confidence in the minds of low-caste people who were tormented by the most despicable caste system. Bhima Bhoi’s date of birth and his birthplace have not been recorded. He was believed to be born in a village called Kankadapara near Rairakhol in the undivided Sambalpur district. However, various sources have cited different years as well as different places of birth. His family belonged to the Khond tribe. Bhoi’s family was not well off and by most accounts his early life was not a happy one. His father died when he was quite young. His mother remarried and had children with her new husband soon after. There is difference of opinions regarding Bhima Bhoi’s loss of sight. Professor Artaballav Mohanty quotes several sources in his Preface to Stuti Chintamani to justify that Bhoi was blind from birth. However, B.C. Mazumdar and Binayak Mishra believe that he had lost his sight at a later period. In his History of Oriya Literature, Mayadhar Mansinha maintains that Bhima Bhoi lost his eyesight in his early childhood, possibly due to a virulent attack of smallpox. Chittaranjan Das, in Odishara Mahima Dharma (Mahima religion in Odisha) shares his view. Bhima Bhoi was initiated to Mahima Dharma, an Indian religious tradition that challenged the authority of caste Hindus, by Mahima Swamy, commonly referred to as Mahima Gosain, whose original name was Mukunda Das. The Mahima Cult attacked the superstitions and blind beliefs which degenerated Hinduism and earned the wrath of caste Hindus. The followers of Bhima Bhoi are called Kumbhipatias, the name derived from the rope of the bark of Kumbhi tree. The Alekhas or Kumbhipatias are opposed to idol-worship; they worship the formless god whom they call Alekha. Stuti Chintamani, a collection of 2000 stanzas, is perhaps the most significant poetical work of Bhima Bhoi. It contains autobiographical and confessional verse and verse depicting degeneration of social values. It also brings out the poet’s deep anguish at the human beings wallowing in guilt and sin. Professor Artaballav Mohanty, in his Preface to Stuti Chintamani, compares Bhima Bhoi to Jesus Christ. As Jesus was crucified for the suffering humanity, Bhima’s soul was on the cross suffering the agony and anguish of a troubled soul. Eminent poet and literary historian, Mayadhar Manasinha has compared him to early Christian evangelists. He has also written the Brahma Nirupana Gita, in which he attempts to spell out the nature and qualities of Brahma. His poetical works need to be viewed in the context of the philosophical ideas of Mahima Dharma. 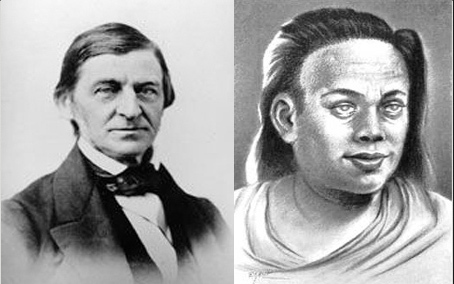 Both Emerson and Bhima Bhoi are radical reformists who fought the prevailing social injustice at different places in two different continents. The former was initially a Christian minister, who delivered lectures Concord, Cleveland and several other places outlining his philosophy. A champion of democracy and human rights at a period when these terms were not much in circulation, Emerson was a naturalist, an idealist and a philosopher. He also played an important role in the crusade against slavery. Emerson had his first experience of slavery at St Augustine. He once attended a meeting of the Bible Society while a slave auction was taking place in the yard outside. He wrote, “One ear therefore heard the glad tidings of great joy, whilst the other was regaled with ‘Going, gentlemen, going!’ (Richardson 1995, 76). Bhima Bhoi, who lived in a remote part in Odisha, was a religious reformer who held out a hope for millions oppressed by dominant castes of the Hindu society. His efforts were directed towards the emancipation of those multitudes who were condemned to lead a life of indignity and deprivation. He did not mind to be condemned to hell if the world is saved: “Mo jibana pachhe narke padithau, jagat uddhar heu” means ‘The sorrow and agonies of all beings are immeasurable, and who can tolerate seeing them? Let my soul be condemned to hell but let the universe be redeemed’. Emerson and Bhima Bhoi came from two different worlds and represented two different societies and two diverse cultures. They never came across each other in their lifetimes. They did not know each other’s mission in life. However, both of them were champions of the marginalized peoples living across the world. A voice of freedom, a note of emancipation was loud and clear in the works of both of them. Both of them raised their voice against exploitation in different forms prevalent in two different societies. The present study aims at bringing out the similarity of tone in their works.